Great Langdale and its neighbouring valley Little Langdale are known simple as Langdale. Great Langdale beginning at Skelwith Bridge is a u-shaped valley formed by glaciers whilst Little Langdale is a hanging valley. The Langdale valley contains two villages Chapel Stile and Elterwater and a hamlet at High Close. The two villages were centres of the Lakeland slate industry. Elterwater Quarry, being the largest, and Spout Cragg Quarry are still working using modern methods and are operated by the Burlington Stone Company. Other local quarries have now fallen into disuse. Langdale was also an important site during the Neolithic period producing stone axes created on the slopes of the Pike of Stickle. It also supplied stone for some Bronze Age items and Neolithic cup and ring marks are found on the Langdale Boulders at Copt Howe. Langdale is home to Crinkle Crags, Pike O’Blisco, the Langdale Pikes and Bow Fell which is the highest fell in the dale attracting walkers, climbers and fell runners. Scafell Pike, Cumbria and the Lake District’s highest mountain can also be climbed from Langdale. On the northern side of Great Langdale lie a group of peaks called the Langdale Pikes and are one of the dales most prominent features. Together they make up one of the most picturesque and probably the best known mountain groups in the area. Harrison Stickle at 736 m (2414 ft) is the largest of the four peaks that make up the Langdale Pikes the other three being Pike of Stickle at 709 m (2326 ft), Loft Crag at 682 m (2238 ft)and Pavery Ark at 700 m (2297 ft). A stickle is a hill with a prominent rocky top. The summit is a short rocky ridge with a cairn at each end the northern one being higher and provides superb views of the valley and all the surrounding major fells groups. Below the steep eastern face of Harrison Sickle lie Stickle Tarn and its ghyll thus ensuring that all drainage from the fell is to Great Langdale. Stickle Tarn is a small turn of about 50 ft deep enlarged by the building of a stone dam in 1838 and is used to supply water for public consumption in Langdale. 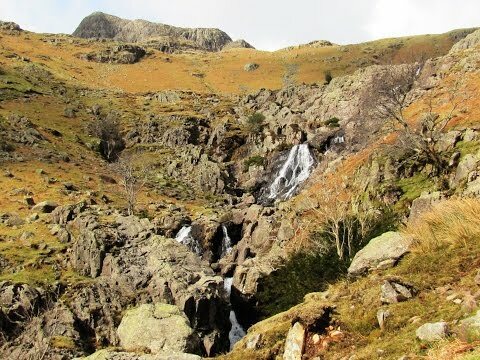 Alongside Stickle Ghyll which descends from Stickle Tarn there is a well walked path from the Stickle Ghyll car park at Old Dungeon Ghyll up to the tarn, parts of which have been improved with stone slabs to reduce erosion. Old Dungeon Ghyll Hotel was originally a farm and inn bought by historian Professor G.M. Trevelyan who donated it to the National Trust. The hotel and the Hikers Bar have a long association with climbing and many famous climbers have stayed at the hotel or drank in the bar. Further down the valley there is the New Dungeon Ghyll hotel built in 1862. We park in the car park with public toilets next to the Dungeon Ghyll pub and head forward on the path to the left of the toilet block. We turn right through the wall then left through a gate and follow the track uphill with Arkle Beck on our right. At the bridge we cross over and keep following the beck now on our left steeply uphill scrambling over the rocks along the way. We eventually cross over the beck via some large stepping stones and keep heading forwards until we arrive at the dam wall of Stickle Tarn. We turn right crossing over the beck (not deep) again via the rocks and head forwards following the path by the side of the tarn on our left. At the end of the tarn we bear left heading along the valley following Bright Beck on our left for a short way. At the cairn we cross over the beck and head forwards to scramble up the rock face. At the top of the rocks we follow the small cairns which bear to the left then at the larger cairn we bear right and keep following the path and cairns until we come to a dip which we cross and head uphill to the summit of Harrison Stickle. We then head back down and turn left towards a large cairn and bear right heading steeply downhill with Pike of Stickle in front of us. When we reach the dip we bear left to a cairn and at the next cairn we bear right to cross over the stream and follow the track uphill on the other side for a short way. At a large white stone we turn right off the track and follow a faint path rising to a brow and a cairn. We now follow the more distinct path and the cairns downhill and then on the level before heading downhill to the pub and car park we can see down below. This is a hard walk on good tracks and paths with steep inclines and declines. Approx 3.6 miles allow 3 hours using OS Explorer Map OL6, The English Lakes south-western area. Parking: Two National Trust pay and display car parks at Dungeon Ghyll Force, £6.50 for all day. Hello,I log on to your new stuff named “Great Langdale – Stickle Tarn – Harrison Stickle round | Lake District (Cumbria) Walks | Walking Guide” regularly.Your story-telling style is awesome, keep up the good work! And you can look our website about مهرجانات. this web page is in fact good and the viewers are truly sharing nice thoughts. posts are very short for newbies. May just you please prolong them a little from next time? Hello Dear, are you really visiting this web site regularly, if so after that you will definitely take fastidious know-how. realize such targeted about my problem. You’re incredible!